The details haven’t sorted themselves out yet, but I will appear at NY ComicCon in February 2009 to sign copies of Captain Freedom. The event occurs on February 6-8 at Jacob Javits Convention Center. For those of you who don’t know what ComicCon is, just imagine all the people from the chess club, the mathletes, the computer lab staff, the cross country team, your friends fluent in Klingon and the D&D players all together in the same place for a weekend. In costume. 2009 guests will include Art Spiegelman, Chip Kidd, my current favorite graphic novelist Bryan Lee O’Malley and many others. A few things: No, I will not be in costume. 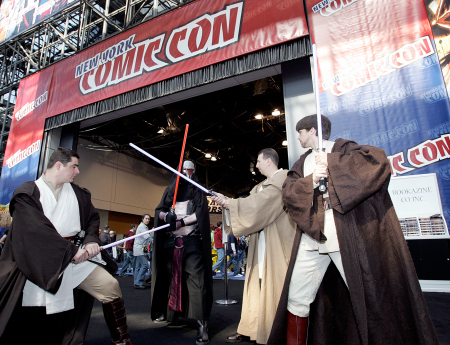 Also, I will not be dueling others with fake light sabers, as I do not wish to injure my book signing hand. Come back here for more information in the New Year.